PHILADELPHIA — On March 22, U.S. Immigration and Customs Enforcement’s (ICE) Enforcement and Removal Operations (ERO) officers removed a fugitive wanted by Salvadoran authorities for aggravated homicide to his home country. 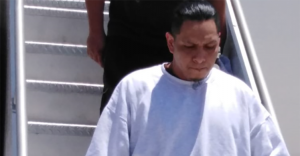 ERO Philadelphia issued Jose Miguel Hernandez-Garcia, 35, a final administrative removal order March 29, 2016, while he was in the custody of the Pennsylvania Department of Corrections serving a sentence for aggravated assault with a deadly weapon. Hernandez-Garcia was a removable alien, in accordance with the Immigration Nationality Act, since he had been convicted of an aggravated felony. On Feb. 21, ERO Philadelphia also received notification that there was an active arrest warrant for Hernandez-Garcia. He was wanted by Salvadoran law enforcement authorities for aggravated homicide. The arrest warrant established Hernandez-Garcia as a confirmed leader of the 18th Street Gang in El Salvador. Hernandez-Garcia entered ERO Philadelphia custody Feb. 26; he was detained at York County Prison in York, Pennsylvania, prior to his removal.